LISA Pathfinder (LPF) is a mission to demonstrate in orbit the technologies for LISA, the ESA/NASA Laser Interferometry Satellite Antenna gravitational wave observatory. 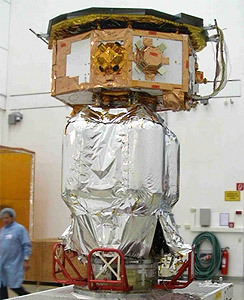 LISA Pathfinder, originally named SMART 2 (one of ESA's Small Missions for Application Research and Technology), is a new ESA space science mission. To be launched in 2015, LISA Pathfinder will be packed with radical instrumentation and technology to prepare the way for LISA, the world's first space-based gravitational wave detector. The basic principle of LISA is to measure the changes in distance between freely floating test masses', literally, small gold blocks held in place by carefully controlled electrostatic fields. The six test masses will be contained in 3 separate spacecraft (two each) arranged in an equilateral triangle with sides of 5 million km! Each of the three arms of the constellation will be optically linked by a system of lasers (laser interferometer') and a software control system so as to form a rigid' structure. LISA Pathfinder is an in-orbit demonstrator of the key technologies for LISA: a kind of physics lab in space. It will test the gravitational reference sensors, the laser interferometry and the micro-Newton thrusters. But instead of a separation of 5 million km, LISA Pathfinder will use test masses only 30 cm apart and placed on a single spacecraft. In fact, because the technology is so challenging, LISA Pathfinder will carry two alternative packages of sensors, lasers and micro-thrusters. One (provided by European institutes and ESA) is called the LISA Test Package (LTP), while the other, the Disturbance Reduction System (DRS), will be provided by NASA under the New Millennium program as ST 7. After the inertial sensor systems, the micro-propulsion is the most innovative technology to be tested on LISA Pathfinder. Two types of micro-Newton thrusters are under development in Europe. Field Emission Electric Thrusters are a type of electric propulsion which use very large electric fields to almost instantly accelerate tiny droplets of electrically conducting-metal up to high velocity. In contrast, micro-cold gas thrusters are tiny proportional valves; in essence, a controlled leak of inert high pressure gas (typically nitrogen). LISA Pathfinder was launched on a Vega launch vehicle into a 207 km × 1540 km, 5.96° Low Earth Orbit. To transfer the spacecraft into its operational orbit a conventional chemical propulsion system, based on the Eurostar-2000 propusion system, is needed, but this must be ejected after use, because even a few kilogrammes of left-over fuel sloshing around within the emptied tanks could disturb the experiments. The operational orbit is a stable and eclipse-free orbit around the L1 Lagrange point, 1.5 million km from Earth towards the Sun. This location helps minimise disturbances from the Earth's gravity, magnetic field and atmosphere. The nominal mission life is just over 1 year, allowing the DRS and the LTP to be separately tested and also allowing special experiments where one system will monitor the performance of the other. This in-orbit feedback will then help the detailed design of LISA. 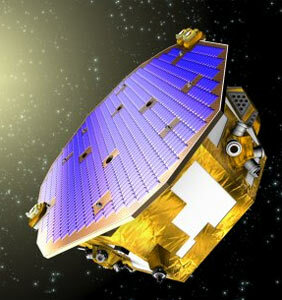 LISA Pathfinder involves an Industrial Core Team of EADS Astrium Ltd (system prime and platform); EADS Astrium GmbH (LTP industrial lead and drag-free control system) and SciSys Ltd (software architecture). The full industrial team comprising companies across Europe will be assembled over the next year via competitive selection. The launch was originally planned for 2008, but has slipped to December 2015. After launch into orbit, the propulsion module propelled Lisa-pathfinder onto a trajectory to the Le Lagrange point. It was jettisoned in January 2016. The mission of LISA Pathfinder ended on 30 June 2017. It was put on a heliocentric disposal orbit. Switching off all systems, the final command was sent on 18 July 2017.